Haven’t decided on a hotel yet? 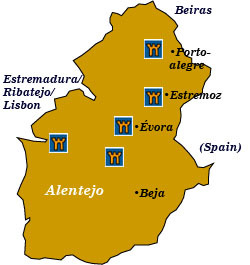 You can look at other available hotels in the Alentejo region with Booking.com. Great expanses of rural land stretch across nearly a third of Portugal with uncluttered horizons, blissfully empty roads, and a slow pace of life. About the only vegetation you’ll see comes from vast groves of olive trees, cork, and oaks. Small, unspoiled villages break up the landscape, their white-washed walls dazzling under a brilliant sun. And each village offers its own traditional craft—from rugs to pottery—unique to the village. More often than not, you’ll find a castle (or the remains of one) on a nearby hilltop, a reminder of the countless battles fought over the centuries between Romans and Visigoths, Moors and Christians, Portuguese and Spanish and French. From the rugged Atlantic coast to the more mountainous north, the Alentejo’s chief draw is its leisurely pace of life. Come here to unwind, indulge in its hearty cuisine, and experience a traditional rural side of Europe. Évora This utterly charming and aristocratic Renaissance town has been a UNESCO World Heritage Site since 1986. First inhabited by the Celts, followed by the Romans and the Moors, its architectural splendor reached a high point in the 14th-16th centuries when it was the preferred capital of the Portuguese kings. Dominating Évora’s maze of streets are the Sé—a fortress-like cathedral where the flags of Vasco de Gama were blessed before his journey to the East, the Templo Romano—a Roman temple that was fortified in the Middle Ages, and the Museu Regional—on the site of a former 16th- 17th-century palace. Castles and fortified towns You’ll find them everywhere. The best ones are Marvão with a spectacular 360º view; also with a magnificent view and full of character is Monsaraz; the 14th-century Castelo de Vide; Viana do Alentejo, which houses a church within its fortified walls; the Gothic-style Évoramonte; the well-preserved Terena, and Estremoz (now a castle hotel). Vila Viçosa The 16th-century, 78-room home of court of the Duke of Bragança is noteworthy for its Paço Ducal, or Ducal Palace. For a good insight into the daily life of the last king of Portugal, stop by for a visit. Elvas Close the Spanish border, Elvas is noteworthy for its impressive fortification still surrounded by ramparts, which are considered among the most important 17th-century military architecture in Portugal. Prehistoric stone monuments Enthusiasts of Neolithic dolmens (temples used as tombs), menhirs (tall upright stones), and stone circles will find them outside of Évora, Elvas, and Castelo de Vide. The Anta Grande do Zambujeiro, near Évora, is a national monument and the largest dolmen in Europe.